The E.A.R Custom Electronic Earplug Series has set the mark in quality and sound enhancements within the shooting sports and law enforcement aspects for over two decades. With recognitions coming from several major groups and organizations, we have developed a variety of custom models to aid you in further enjoyment of your target shooting, hunting experience, safety requirements, and radio communications. The Digital Advantage unit uses the basic backbone of digital technology, with simple bandwidth circuitry. It features two manual adjustment potentiometers that allow the user to control the bass and treble tones and set them according to their own preference. This means the user has control on setting the audio to their own specific liking much like an equalizer on a stereo system. 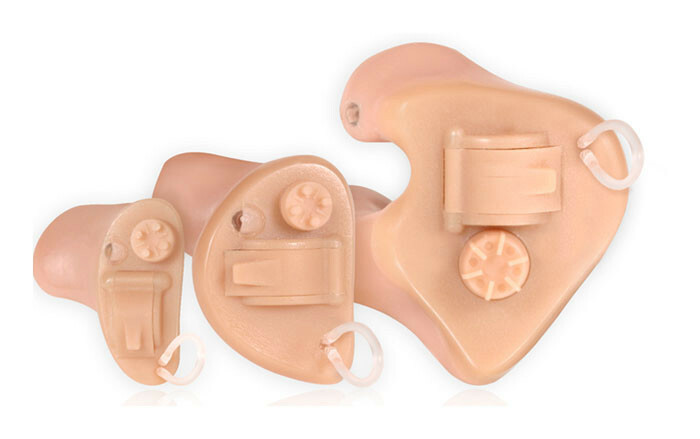 With these features, the Digital Advantage is an excellent low-end digital choice and is popular for active individuals who also maybe slightly hard-of-hearing. It has basic programmable digital technology that features such things as speech enhancement for better vocal clarity, tri-mode noise reduction to amplify soft sounds but compress louder ones, and adaptive feedback reduction to reduce the "whistling" effect heard in many hearing devices when the unit is improperly fitting in the ear. This increase to the circuit boards capability and design gives the Digital Basic a better sounding environment to the users ear(s). Basically put, it's going from HDTV to Plasma screen technology, and is an excellent unit for the general, and active, shooting/hunting and security enthusiast. The Digital Basic Multi-Memory features the same design as the Digital Basic but we've added a second program to the chips circuit board. This allows us to provide a secondary enhancement/protection program mode that is pre-set to reduce background sounds such as wind and road noise without reducing the volume. So it's like adding a "mute" switch to the original setting without actually reducing the volume to the ear. Originally developed for the waterfowl community, this multi-memory feature becomes very valuable to those users who are constantly surrounded by wind and miscellaneous background sounds. With a simple push button on the faceplate, the user can go from a normal enhancement/protection mode to a further suppressed background sound mode before recycling it back to the original position. The Digital Basic Multi-Memory unit has become a favorite for waterfowl and upland bird hunting, as well as those who wish to carve out unwanted "distraction" noise without losing complete contact with their environment. The Digital Plus features an increased bandwidth for better clarity through the entire frequency range over the Digital Advantage and Digital Basic models. It also features a programmable circuit board that allows for the same capabilities as the Digital Basic - tri-mode noise reductions, feedback reduction and enhanced speech abilities. The main difference between the programmable Digital Basic and the programmable Digital Plus is that we have further control to enhance specific frequency ranges. This fine tunes the circuit to provide better vocal benefits for a hard of hearing individual, better pitch and tone adjustment for game call users and an increase to fidelity for more definition of environmental sounds. The Digital Plus Multi-Memory uses the same matrix as the Digital Plus model but will feature a second program that will reduce background and wind noise. Much like the Digital Basic Multi-Memory, the secondary program allows the user to reduce, or "compress," distraction noises such as wind, rain and miscellaneous road noise, without reducing the volume to the ear. This is a valuable tool for many active individuals who are trying to hear something clearly in the field while eliminating unwanted noise from being amplified through the circuit board. The push button control is manually manipulated from the faceplate and goes from a normal default program to a secondary compression mode before recycling itself back to the first program. Think of the second program being like a "noise cancellation" mode, as we filter the pattern of sound through the units matrix and reduce unwanted noise from being an impact on the perceived sound to the ear.